"It's A Bloodbath Out There Across Almost Every Strategy"
With most markets tumbling in the past month as the high-flying growth and tech names have been painfully grounded as today's action in Amazon and Google vividly demonstrates, the past month has been especially painful for momentum traders, with the drop from the September highs now worse than that observed during the market's February VIXtermination correction. 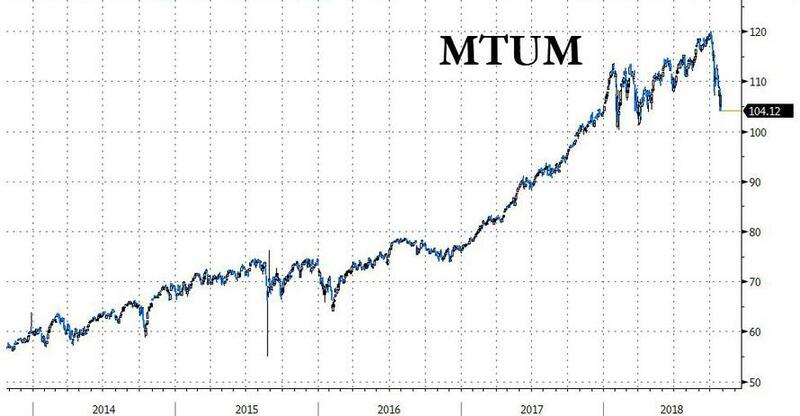 In fact, extending the chart, this is the worst drop in the iShares Momentum (MTUM) ETF on record. And in a world in which every aspect of the market is repackaged for algo use, the collapse in momentum trading means that hedge funds using models to follow big market trends have been whiplashed as volatility has spiked; in fact according to Bloomberg, trend - and momentum chasers - are now among the biggest casualties of a stock rout that has accelerated worldwide. Within this group, it is the group of trend-followers known as CTAs, or commodity trading advisers, that has been hit the hardest with Leda Braga’s BlueTrend hedge fund, GAM Holding AG’s Cantab unit and Man Group Plc’s AHL unit among those suffering steep losses in October. While on paper, CTAs use computer-driven models to navigate markets and trade everything from equities to bonds to currencies to commodity futures, in reality they simply chase momentum and try to isolate an upward (and occasionally) downward pattern which to piggyback on. Unfortunately for their programmers, with volatility surging, the market's traditional patterns have all been shattered. 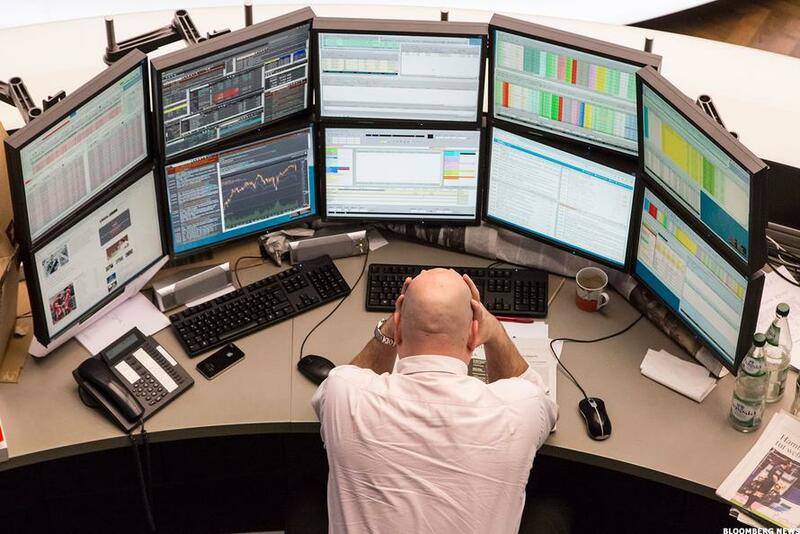 Computer-driven hedge funds were already headed for their worst year ever before this month’s volatility, "amid slowing corporate earnings, political turmoil in Italy and uncertainty over Brexit." During the February correction, they tumbled more than 4% for their worst month since 2001, according to a Eurekahedge index that tracks the category. 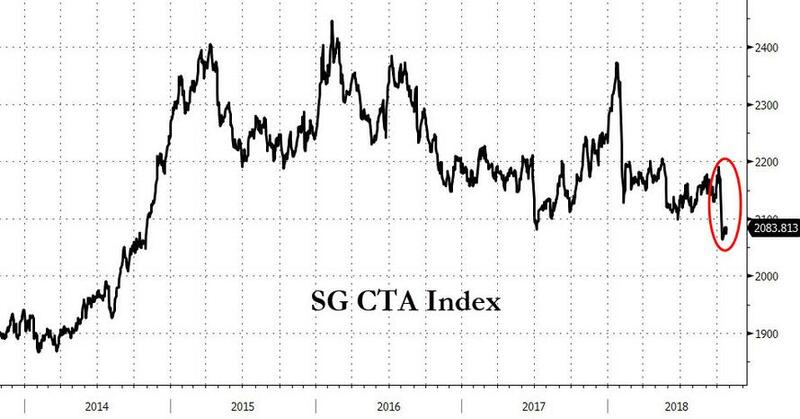 Meanwhile, as the SG CTA Index shows, after the October rout, the performance of trend followers is set to drop to a 4 year low. "It’s a bloodbath out there across almost every strategy with very few exceptions," Vaqar Zuberi, head of hedge funds at Mirabaud Asset Management, told Bloomberg. "CTAs have been caught by a double-whammy with rising rates and equities plummeting. There’s only one exit and everyone is trying to exit now because the models are telling them to do so." Braga’s BlueTrend hedge fund is down 4.7 percent this month through Oct. 19, bringing its year-to-date loss to 12.8 percent. Cantab Capital Partners Quantitative Fund-Aristarchus fell 9.1 percent through Oct. 19 this month and has plummeted 27.7 percent this year. AHL Diversified fund was down 3.8 percent through Oct. 19 this month, worsening losses for this year to 10.3 percent. AHL Alpha was down 2.3 percent through Oct. 19 and lost 4.5 percent year-to-date. Aspect Diversified fell 9.9 percent this month through Oct. 23 and is down 12.7 percent so far this year. 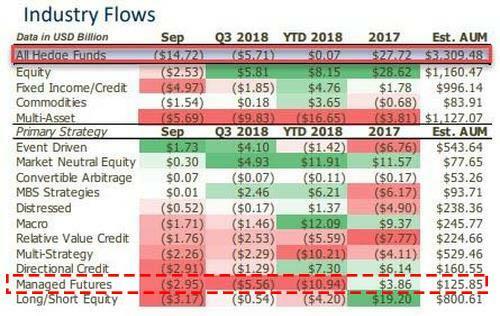 As discussed earlier this week when we cited the latest eVestment data, the poor performance has led to an exodus of capital from hedge funds, with CTAs, or managed futures, among the hardest hit, suffering some $11 billion in redemptions. Of course, trend followers are just one of the many hedge fund strats that have gotten crushed this year: as we discussed on Wednesday, long-short equity funds, and which as a result of the decade-long bull market forgot to actually "hedge", were caught off-guard and positioned heavily on the long side, leading to even greater losses. In fact, according to Goldman, equity long-short hedge funds suffered one of their worst ever losses on Wednesday, pushing declines this month to 8.7%. CTAs, which also have extensive exposure in commodities, were also hammered by the recent plunge in oil. According to Zuberi "earlier this week Saudi Arabia came out and promised two million barrels of extra capacity,” noting that CTAs were positioned for higher prices and long oil. "That was really the cherry on the top." So what will CTAs do next? According to Nomura's Charlie McElligott, 2631 in the S&P is the next "sell level", at which point CTAs will go down to just "14% Long." We're almost there. 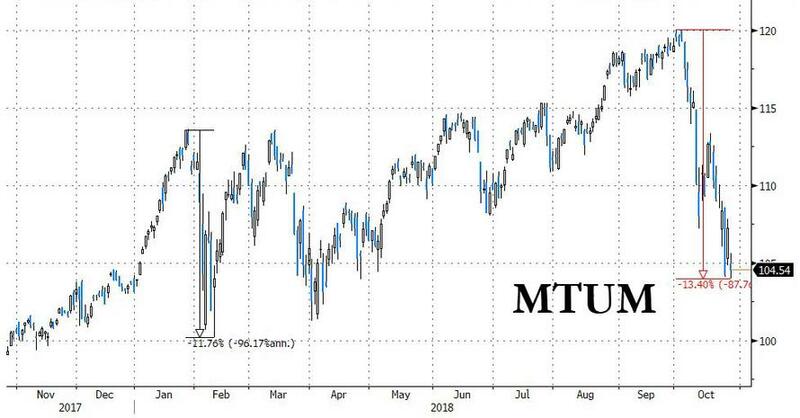 Meanwhile, should the selloff extend even further, a move below 2577 would see the CTA Trend position flip to outright "-100% Max Short", according to Nomura. Only then- with all the algos short - will it be time to finally buy the dip, ahead of verbal central bank intervention and rise the next furious CTA short squeeze to new all time highs.